Little Devil & I get to know about this place a few years back, when out of the blue my FIL keep coming back to this location to eat Kway Teow Mee. On one fine day, he just keep insisting that we must go and try. As we are staying in Hougang, it took us about 20 mins to get here. It was a Saturday morning and finding a parking spot was really a hassle. Alas, it also took us another 30 mins of wait before we get our order. Hungry and annoyed, my first impression here was less memorable. This time around, after sending someone to the airport, we decided to give this place a try again. As it has received many endorsements from the media and food bloggers, there must be something good about this place. Best part, it was a weekday morning, so we don't expect it to be packed with people. Occupying two shops, Jalan Tua Kong Lau Lim ('JTK') stall can be quite big. 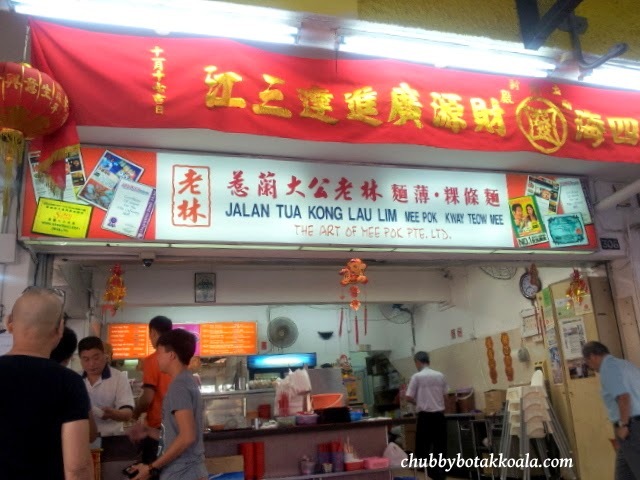 One shop sell the fishball noodle, drinks and toast while the other location, also have Yong Tau Fu. For a bright sunny day, the al-fresco can be considered quite warm, there is an option for indoors in the second shop. You must order at the cashier, make payment and get your queue number to put on your table. 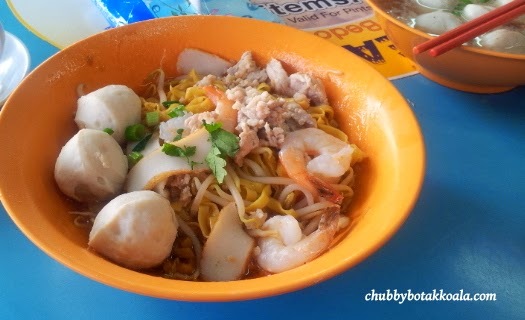 We ordered 2 dry Mee Pok ($4 each) and a bowl of Fish Ball Soup ($5). We waited about 15 minutes before the food was served. The portion size is above average. Each bowl you get 3 fish balls, few slices of fish cakes, bak chor and lean meat and ... Wow, I see prawns!! Yup, 3 pieces of prawns and they are deshelled. I have to admit, now you know where the $$$ goes to. The noodle is cook to al-dente, not sticky and with a bite of crunchiness in it. Covered under the ingredients are the generous serving of pork lard and pork oil that basked the noodle. Wow, no wonder the noodle is yummy. 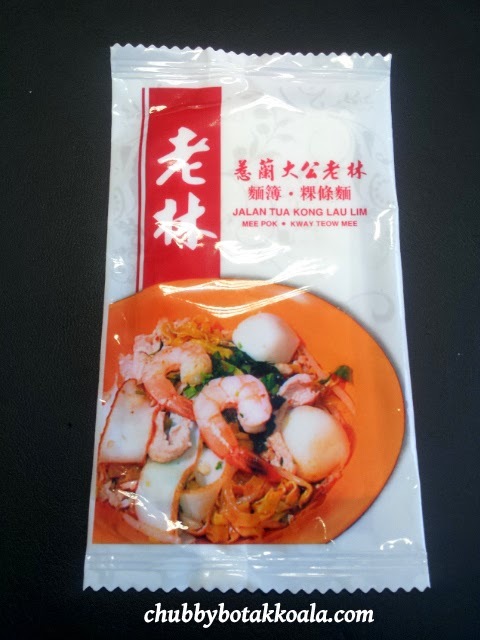 The fish ball is bouncy but soft, while the rest of the ingredients are fresh, especially the prawns. As I ate my noodle without chilli, I can tell you it is very flavourful. LD's like her noodle as well, and she approved of the chilli version of the mee pok. The Fish Ball Soup has around 10 fishballs in it. 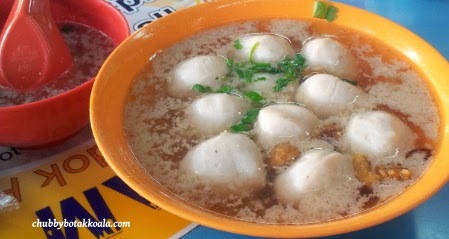 The soup looks a bit cloudy, covered with excess of the fishball which add to the taste of the soup. Again the fishball is soft and springy. Very Q. Service here is very minimum, as you need to go to the cashier to order before they deliver your food. Overall, based on our second experience here JTK fishball noodle is one of the good fishball noodle around. Price definitely higher, however you are paying for the quality here. Waiting time will be the minus point here, but at least you can seat, have a drink and chit chat while you wait. Cheers! !